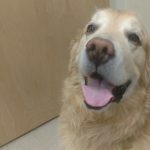 An 8 year-old spayed female Golden Retriever was referred to the Foster Hospital for Small Animals with a three-week history of right forelimb lameness. On physical examination the dog would not bear weight on the affected leg when standing and a toe touching lameness was present when walking. Pain was elicited with light palpation of the right proximal humerus. 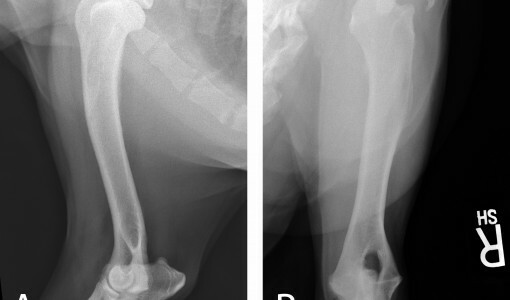 Initial forelimb radiographs from the referring veterinarian were considered within normal limits. Given the persistent and progressive lameness, follow-up radiographs of the right forelimb were obtained. Figures 3. Lateral (A) and craniocaudal (B) radiographs of the right humerus. On the lateral view, a small amount of slightly irregular periosteal new bone was identified along the caudal cortex of the proximal humerus. No abnormalities were detected on the craniocaudal view. Although the periosteal reaction was not definitive for an aggressive bone lesion, given the history, signalment and the proximal humeral location a primary bone tumor was considered the most likely differential diagnosis. A bone biopsy was recommended and was performed with fluoroscopic guidance. Figure 4. Sagittal T2-weighted fat saturated image of the right humerus (A) and sagittal T1-weighted image of the right humerus (B). Histopathology revealed reactive new bone and extensive neutrophilic and histiocytic inflammation, but no clear evidence of neoplasia. The clinicians and owners were faced with a difficult decision – whether to pursue an additional surgical biopsy or perform a forelimb amputation. Collaborately, we decided to perform a musculoskeletal MRI to further evaluate for evidence of a neoplastic bone lesion. Question: Do the MRI images help differentiate an inflammatory from a neoplastic etiology? 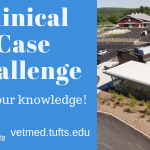 Question: What would your next clinical step be in the management of this case? Figure 5. Labeled sagittal T2-weighted fat saturated image of the right humerus (A) and sagittal T1-weighted image of the right humerus (B). The results of the MRI examination were consistent with an extensive aggressive bone lesion of the right humerus. 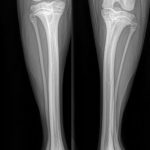 The primary differentials were primary bone tumors including osteosarcoma, chondrosarcoma, fibrosarcoma and hemangiosarcoma. With this additional diagnostic information a right forelimb amputation was elected. Histopathology performed on the humerus of the amputated limb identified a mass comprised of tightly packed neoplastic spindle cells with islands of osteoid matrix consistent with osteosarcoma. The adjacent muscles were evaluated microscopically and were determined to be edematous. The owners elected to follow the surgical resection with chemotherapy using a protocol that extended over a period of five months. Six months following the MRI and amputation surgery thoracic metastatic disease was detected. With an overall decline in the quality of life of the patient, euthanasia was elected. MRI is very sensitive to pathology within the musculoskeletal system, particularly within the medullary cavity and the tissues surrounding the long bones. This allows the detection of a range of diseases from bone bruising or stress fractures in athletes to a neoplastic infiltration, all of which may be present without radiographic abnormalities. 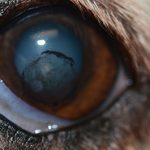 A study of a small number of dogs has also shown that MRI is the most accurate predictor of primary bone tumor margins in dogs as compared to radiographs, computed tomography (CT) and bone scintigraphy. This is particularly useful in planning limb-sparing surgery. While MRI is clearly not necessary for the diagnosis of every primary bone tumor, it can be a valuable diagnostic aid when clinicians are struggling with equivocal radiographic or biopsy findings.